Carnegie Mellon professor of art Bob Bingham, in collaboration with Carnegie Mellon alumni Robin Hewlett and Ally Reeves, has created One Mile Garden, a community initiative in York, Ala. One Mile Garden will provide residents with opportunities for education and better health. The creators will work with locals to establish garden sites and to develop a program for growing healthy food. One Mile Garden was created in collaboration with the Coleman Center for the Arts in downtown York. Shana Berger, the co-director of the Coleman Center, initially contacted Bingham with the intent of collaborating on a community agriculture program. Berger had viewed Bingham’s website and was impressed by his 2005 “We Grow” project. “We Grow,” based in the Homewood-Brushton neighborhood in Pittsburgh’s East End, is a community-based program that encourages the creative use of vacant land for sustainable agriculture. The project quickly expanded with Bingham’s inclusion of Carnegie Mellon alumni Hewelett and Reves. “I could not imagine doing it alone, so I found two former students who create art about food to collaborate with,” Bingham said. Bingham, Hewlett, and Reeves spent a week in York in March 2008 with the hopes of gaining an understanding of the layout of the town’s land. During this visit, they met Catherine Shelton, a self-taught organic gardener. 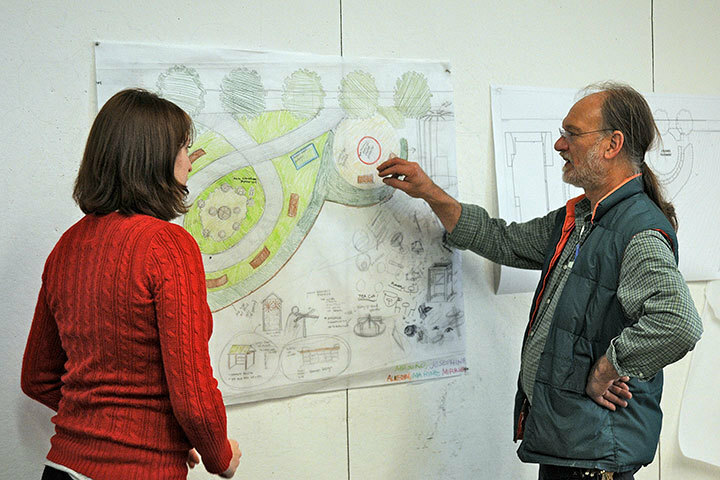 Working with her, the artists established the first large community garden at the Coleman Center. As the project grew, satellite gardens were then established at sites throughout York. “On Oct. 31, 2009 we planted a 54-fruit-tree orchard in Cherokee Park with the Fruit Tree Planting Foundation from California, with the help of 40 volunteers from the Truevine Fellowship Church across the street,” Bingham said. In addition to the Cherokee Park Orchard, other sites include the town’s Eastern Star Baptist Church and West End Junior High School. One Mile Garden was featured in an exhibition at the Coleman Center gallery from Sept. 25 to Nov. 13, 2009. Bingham says he will visit once a quarter to check in on the gardens. He hopes to continue developing the project, establishing an artful way to assist people in growing larger amounts of food and combining a process of distributing it within the community.